Hillary Clinton has canceled her scheduled Monday evening fundraising appearance in San Francisco as she recovers from an illness, the Clinton campaign confirmed Sunday night. Clinton was scheduled to attend an event at the Masonic, featuring performances by k.d. lang and Lizz Wright. The event will go on as planned, and Clinton may make an appearance via teleconference, NBC Bay Area learned late Sunday. Clinton was attending a 9/11 anniversary ceremony in New York on Sunday when she became "overheated." 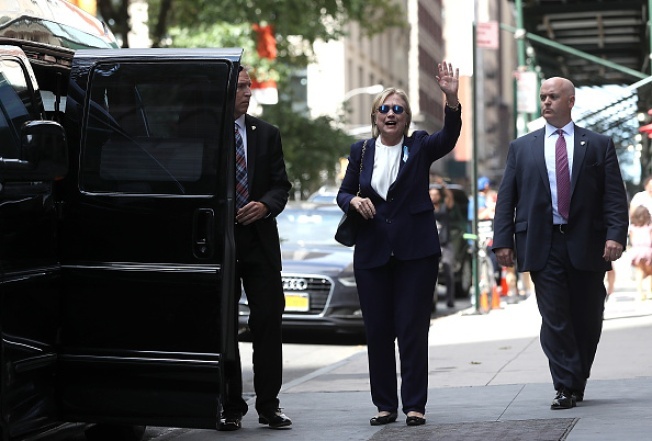 The Democratic presidential candidate was later diagnosed with pneumonia, and a doctor gave her antibiotics, advised her to rest and to modify her schedule. She stayed in New York to recover. Cyndy Wu, chair of the San Francisco Democratic party believes it's just part of what's been a long, hard-fought campaign. "She's been on the campaign trail for a year and a half, so it's natural to have ups and downs," Wu said. Clinton's illness comes on the heels of her opponent Donald Trump's questions about her overall health. Monday's event was supposed to be Clinton's last appearance in the Bay Area before Election Day. She was scheduled make other California appearances Tuesday, but those also were canceled. Attendees at Monday's fundraiser at the Masonic will pay between $250 and $50,000 toward the campaign. The event is scheduled to start at 4:30 p.m.
Clinton's running mate Tim Kaine is slated to be in the Bay Area on Wednesday, first at a morning roundtable in Atherton, then at a luncheon co-hosted by Republican Meg Whitman. He'll finish the day in San Francisco.